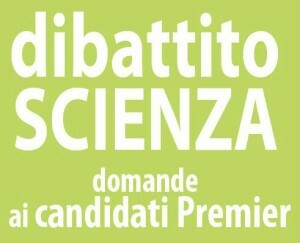 Ten simple questions, on ten complex science-related issues: for the first time the six candidates willing to become the next Italian Prime Minister have been officially asked to declare their attitudes towards science, thanks to the initiative launched online by the two Italian science writers Moreno Colaiacovo and Marco Ferrari. The primaries conducted a few weeks ago within the center-left coalition were chosen for the first, successful test: all five candidates answered in writing, providing their prospective voters with a glimpse of their views on six issues, selected online by a group that was originally formed on Facebook (with the contribution of many science writers, journalists, bloggers, scientists and “simple” citizens) and then moved to its own website. For the second round, addressed to the candidates for the political elections that will take place next February, the huge group (more than 1.200 are currently subscribed to the Facebook group) decided to widen the range of questions, that are now ten and explore issues such as: investments to promote public and private research, energy, environment, management of seismic and hydrogeological risks, digital agenda, assisted reproduction (plagued in Italy by a highly controversial legislation condemned by the Strasbourg Court on Human Rights) and living will, science in schools, climate change and animal research. The questions have just been published on the website of Le Scienze-Scientific American, among the first supporters along with Science Writers in Italy.